I don’t cook nearly as much Persian food as I’d like to. Unfortunately it’s not food that can be whipped up quickly and needs the better part of an afternoon to prepare and cook – it’s slow cooking at it’s best. The saving grace to all those hours is that khoresht freeze and reheat beautifully so when I do make some I always make a large batch to portion up and freeze for those nights when I don’t have time to cook. 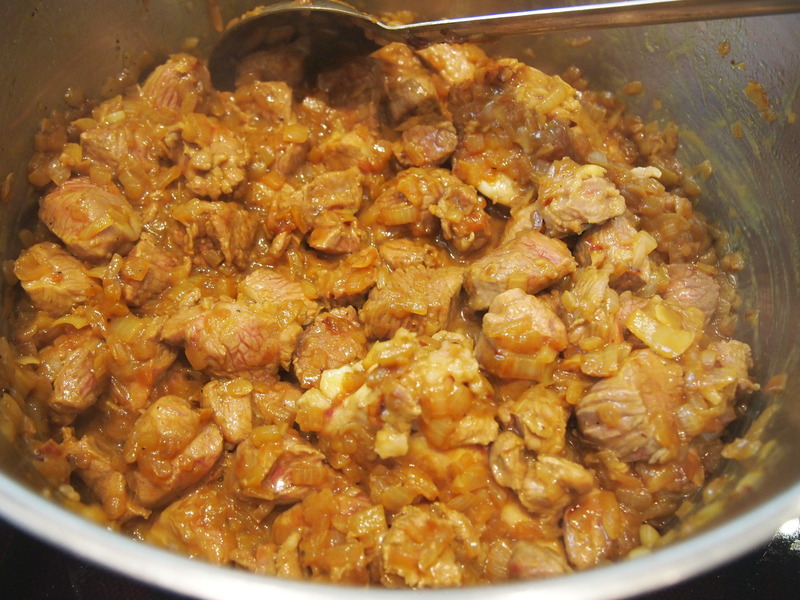 And like all slow cooked stews and braises the flavours enhance and deepen the second time around. I’ve posted some other Persian recipes and there’ll be more coming soon but this Khoresht or stew is a particular favourite. Growing up we almost exclusively ate Persian food and I remember my working mother spending hours in the kitchen on a Saturday making at least five different khoresht for our weekly dinners, a mammoth task! I was always anxious however when school friends came for dinner that they wouldn’t enjoy the food and would find it too unusual for their palate. I needn’t of worried because that never happened, every plate was wiped clean and seconds asked for. 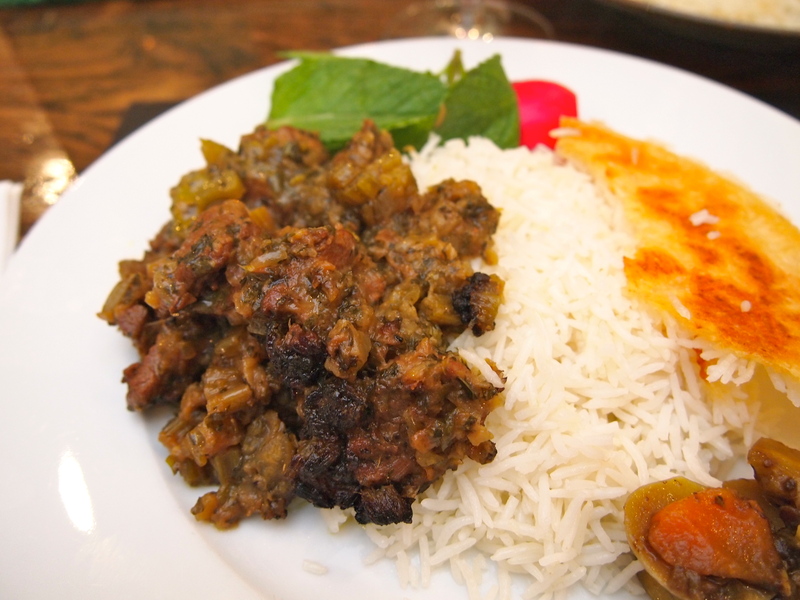 That’s the lovely thing about Persian cuisine; it’s exotic enough to be interesting and different yet there is something very familiar about it. 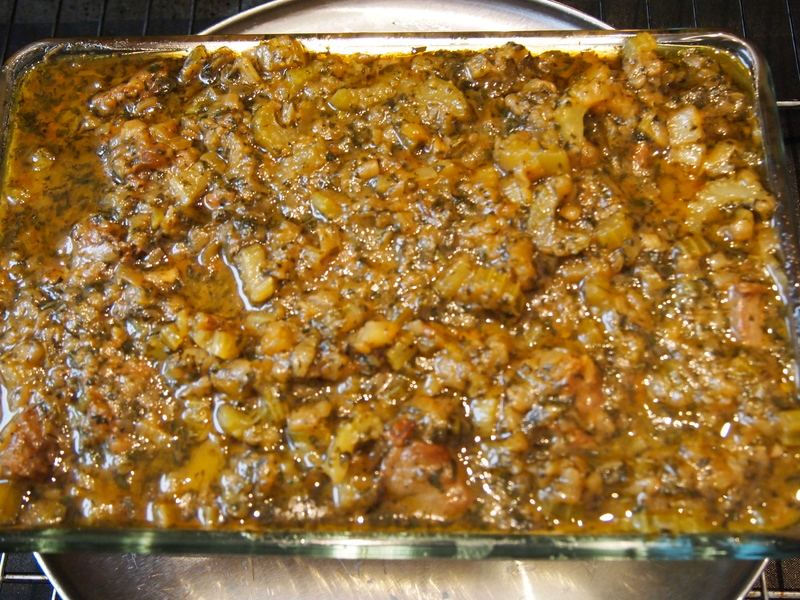 This Khoresht may be overlooked by a lot of people as braised celery may not sound very appealing but it is actually one of the khoresht that most foreigners love and it’s my husbands favourite, so don’t be put off by the thought of cooked celery – it becomes delicious and sweet when braised for a long time. 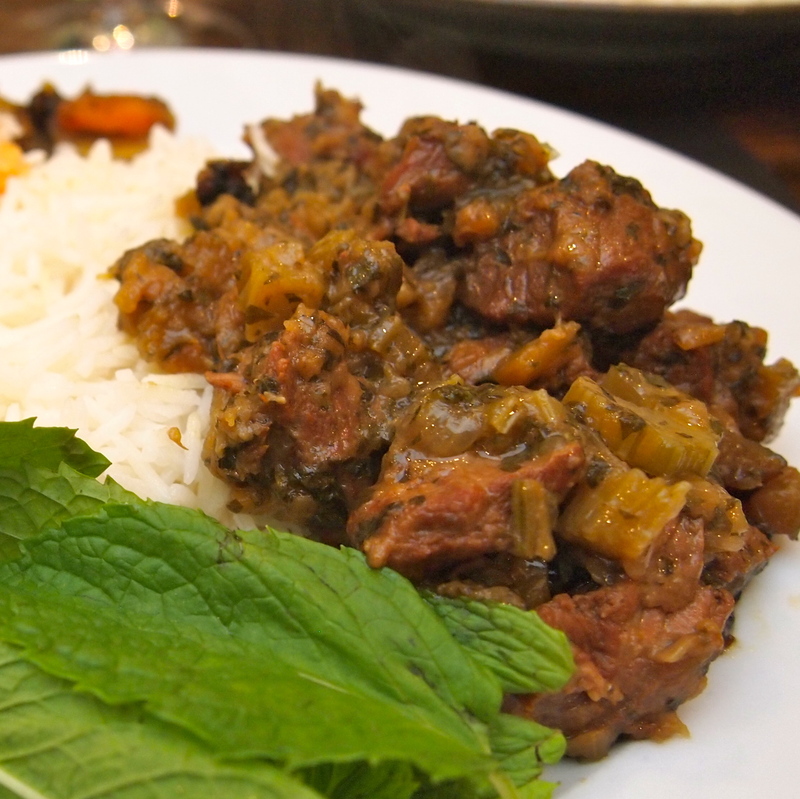 As I’ve mentioned before all khoresht are eaten with steamed basmati rice with accompaniments of fresh herbs such as mint, basil and red radishes, or a salad of finely diced cucumbers and tomatoes with a lemon dressing. If you have a Persian grocery store nearby then a jar of Persian torshi, pickled mixed vegetables, is wonderful on the side. Place a heavy bottomed large saucepan over medium heat and add a good amount of oil, at least a quarter of a cup. Add the onions and stir and fry until the onions are golden brown and caramelised. This should take about 20 minutes. Add more oil if the pan is running dry and stir regularly to ensure that the onions brown evenly and don’t get scorched. While the onions are frying rinse the meat in several changes of cold water and drain well. Wipe dry with paper towels. When the onions are ready add the turmeric and stir and cook for another couple of minutes. Increase the heat and add the meat. Cook stirring the meat for about 5 minutes until it changes colour. Place a kettle on to boil and add 2 teaspoons salt and 1 teaspoon black pepper to the meat. 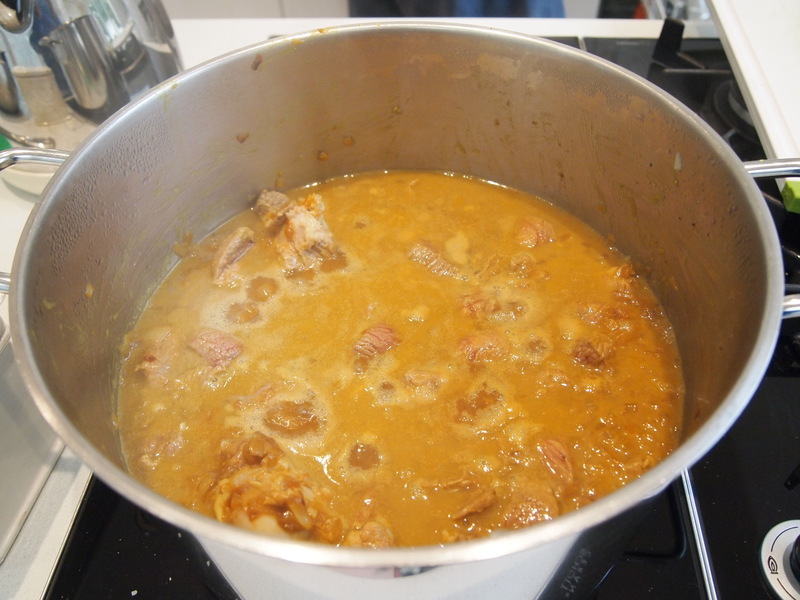 Give it a good stir and then add enough boiling water to just cover the meat, with only the tips of the meat showing. Bring to the boil then lower the heat to a gentle simmer. Cover with a lid a simmer for about 1 hour or until the meat is half cooked. While the meat is cooking prepare the celery. Place a large skillet over medium heat and add enough oil to cover the surface of the pan. Add the celery along with a pinch of salt and cook gently until the celery is completely soft. Remove the celery with a slotted spoon, trying to keep as much oil in the pan as possible, and set aside. To the same pan add the finely chopped celery leaves, parsley and mint. If the pan looks to be running dry add some more oil, it’s important that the herbs have enough oil to sauté in otherwise they will scorch and become bitter. Gently sauté the herbs until they are soft and fragrant and the oil in the pan has taken on a green tinge, this should take about 8-10 minutes on a gentle heat. When the meat has cooked for an hour remove the lid and add the lemon juice,cooked celery and herbs including the green tinged oil from frying the herbs. 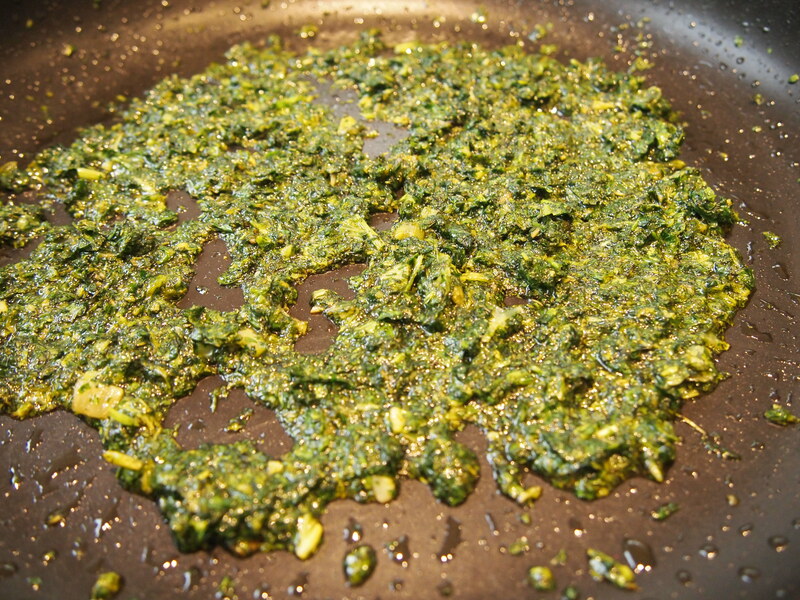 Stir to combine everything and taste for seasoning, adding more salt if necessary. Bring the pan to the boil again, then reduce the heat to gentle simmer and cook uncovered for a further hour or until the meat is fork tender and the juices have reduced and thickened. At this stage the khoresht can be served and eaten but I prefer to place the khoresht into a oven proof casserole and place it in a 150C oven for a further hour. 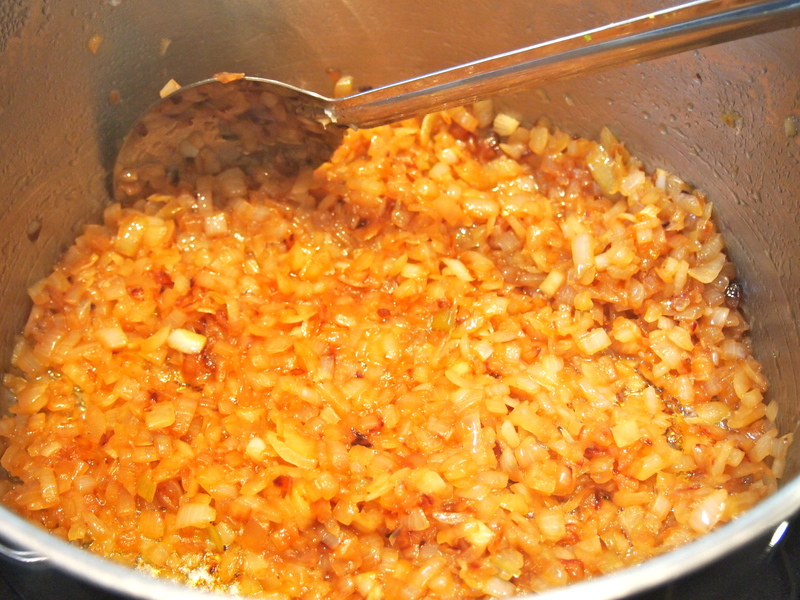 This step will achieve a nice golden topping and further concentrates the flavours. During the cooking time keep checking the khoresht and if the top is browning too much cover with foil. Serve with basmati rice.